For the movie, see The Driftless Area. Relief map showing primarily the Minnesota part of the Driftless Area. The wide diagonal river is the Upper Mississippi River. In this area, it forms the boundary between Minnesota and Wisconsin. The rivers entering the Mississippi from the west are, from the bottom up, the Upper Iowa, Root, Whitewater, Zumbro, and Cannon Rivers. A small portion of the upper reaches of the Turkey River are visible west of the Upper Iowa. To the west, outside the Driftless Area where more regular topography is evident, tributaries of the Wapsipinicon and the Cedar Rivers are seen. The Driftless Area is a region in southeastern Minnesota, southwestern Wisconsin, northeastern Iowa, and the extreme northwestern corner of Illinois, of the American Midwest. The region escaped glaciation during the last ice age and, consequently, is characterized by steep, forested ridges, deeply-carved river valleys, and karst geology characterized by spring-fed waterfalls and cold-water trout streams. Ecologically, the flora and fauna of the Driftless Area are more closely related to those of the Great Lakes region and New England rather than those of the broader Midwest and central Plains regions. Colloquially, the term includes the incised Paleozoic Plateau of southeastern Minnesota and northeastern Iowa. The region includes elevations ranging from 603 to 1,719 feet (184 to 524 m) at Blue Mound State Park and covers an area of 24,000 square miles (62,200 km2). The rugged terrain is due both to the lack of glacial deposits, or drift, and to the incision of the upper Mississippi River and its tributaries into bedrock. An alternative, less restrictive definition of the Driftless Area includes the sand Plains region located northeast of Wisconsin's portion of the incised Paleozoic Plateau in the southwestern part of the state. This portion of the Driftless Area in the southwestern section of Wisconsin's Central Plain also lacks evidence of glaciation (although modified by glacial meltwaters that collected in Glacial Lake Wisconsin), and contains many isolated Hills, Bluffs, Mesas, Buttes, and Pinnacles that are outlying eroded Cambrian bedrock remnants of the plateau to the southwest. Retreating glaciers leave behind silt, clay, sand, gravel, and boulders called drift. Glacial drift includes unsorted material called till and layers deposited by meltwater streams called outwash. While drift from early ( pre-Illinoian) glaciations has been found in some parts of the region,    much of the incised Paleozoic Plateau of Wisconsin and northwestern Illinois holds no evidence for glaciation. The region has been subject to large floods from the melting Laurentide ice sheet and subsequent catastrophic discharges from its proglacial lakes, such as Glacial Lake Wisconsin, Glacial Lake Agassiz, Glacial Lake Grantsburg, and Glacial Lake Duluth. 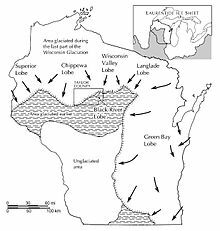 The last phases of the Wisconsin Glaciation involved several major lobes of the Laurentide ice sheet: the Des Moines lobe, which flowed down toward Des Moines on the west; the Superior lobe and its sublobes on the north; and the Green Bay lobe and Lake Michigan lobes on the east. The northern and eastern lobes were in part diverted around the area by the Watersmeet Dome, an ancient uplifted area of Cambrian rock underlain by basalt in northern Wisconsin and western upper Michigan. The southward movement of the continental glacier was also hindered by the great depths of the Lake Superior basin and the adjacent highlands of the Bayfield Peninsula, Gogebic Range, Porcupine Mountains, Keweenaw Peninsula, and the Huron Mountains along the north rim of the Superior Upland bordering Lake Superior. The Green Bay and Lake Michigan lobes were also partially blocked by the bedrock of the Door Peninsula, which presently separates Green Bay from Lake Michigan. In earlier phases of the Wisconsinan, the Driftless Area was totally surrounded by ice, with eastern and western lobes joining together to the south of it. Overall, the region is characterized by an eroded plateau with bedrock overlain by varying thicknesses of loess. Most characteristically, the river valleys are deeply dissected. The bluffs lining this reach of the Mississippi River currently climb to nearly 600 feet (180 m). In Minnesota, Pre-Illinoian-age till was probably removed by natural means prior to the deposition of loess. The sedimentary rocks of the valley walls date to the Paleozoic Era and are often covered with colluvium or loess. Bedrock, where not directly exposed, is very near the surface and is composed of "primarily Ordovician dolomite, limestone, and sandstone in Minnesota, with Cambrian sandstone, shale, and dolomite exposed along the valley walls of the Mississippi River." In the east, the Baraboo Range, an ancient, profoundly eroded monadnock in south central Wisconsin, consists primarily of Precambrian quartzite and rhyolite. The area has not undergone much tectonic action, as all the visible layers of sedimentary rock are approximately horizontal. Karst topography is found throughout the Driftless area. This is characterized by caves and cave systems, disappearing streams, blind valleys, underground streams, sinkholes, springs, and cold streams. Disappearing streams occur where surface waters sinks down into the earth through fractured bedrock or a sinkhole, either joining an aquifer, or becoming an underground stream. Blind valleys are formed by disappearing streams and lack an outlet to any other stream. Sinkholes are the result of the collapse of the roof of a cave, and surface water can flow directly into them. Disappearing streams can re-emerge as large cold springs. Cold streams with cold springs as their sources are noted as superb trout habitat. The Mississippi River passes through the Driftless Area between and including Pool 2 and Pool 13. In Illinois: the Apple River and the Galena River (a.k.a. the Fever River). The Saint Croix in Minnesota and Wisconsin is another important river in the Driftless Area, as it was the outlet for Glacial Lake Duluth, forerunner to Lake Superior, when the eastern outlet was blocked by the continental ice sheet. These rivers all have deep, dramatic canyons giving testimony to the immense quantity of water which once surged through them. The Wisconsin River drained Glacial Lake Wisconsin. Glacial River Warren, whose bed is now occupied by the Minnesota River, drained the colossal Glacial Lake Agassiz. There was ample water to dig a very deep, hundreds-of-miles-long gash into the North American bedrock. The climate is humid continental, displaying both the cool summer and warm summer subtypes as one travels from north to south. The United States Department of Agriculture has the region falling mainly in zones 4a and 4b, with the southern fringe being 5a. A few patches in Wisconsin are 3b. The winters in zones 4a and 4b can be quite severe, with the Mississippi freezing over. Prior to European settlement in the 19th century, the vegetation consisted of tallgrass prairie and bur oak savanna on ridgetops and dry upper slopes, sugar maple- basswood- oak forest on moister slopes, sugar maple-basswood forests in protected valleys and on north-facing slopes, wet prairies along the rivers and some mesic prairie on the floodplain farther back from the river. [ citation needed] There were probably also oak forests that contained no sugar maple. Marsh and floodplain forests were also common on river flood plains. Prairie was restricted primarily to the broader ridge tops, which were unfavorable sites for trees due to thin soils and shallow bedrock, rapid drainage, and desiccating winds; all these conditions were also good for carrying fires across the landscape. Prairies also occurred on steep slopes with south or southwest aspect (see goat prairie ). Natural fire, which has long been vigorously suppressed, was essential for the regeneration of such prairies. Evidence of ancient extinct ice age animals that once inhabited the Driftless Area has been discovered over the years. An example of extinct Pleistocene megafauna in the area is the Boaz Mastodon, a composite skeleton of two separate Mastodons found in the 1890s in southwestern Wisconsin. The Midwest Driftless Area Restoration Effort is a multi-agency cooperative effort to restore the landscape. The main issues are water pollution from agricultural and animal runoff, and erosion. [ citation needed] Many farmers in the region utilize Contour plowing, Strip Cropping, and other agricultural practices to reduce soil erosion due to the hilly terrain. Water pollution is particularly critical in karsted regions such as this, in that it can degrade or destroy prime cold water fish habitat. Soil erosion presents the Army Corps of Engineers with a particular problem, in that it requires them to dredge the Mississippi River shipping channels to keep them open. Trout Unlimited is part of this effort, if only because of the superb cold-water streams the region supports. A symposium was held in October 2007 in Decorah, Iowa, "to share the results of research, management and monitoring work in the Driftless Area." The Nature Conservancy is also interested. The Driftless Area contains more than half of the world's algific talus slopes, a type of small, isolated ecosystem. These refugia create cool summer and fall microclimates which host species usually found further north. 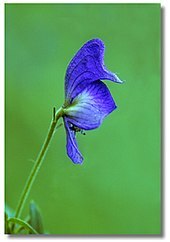 They contain at least one endangered species, the Iowa Pleistocene Snail, and a threatened plant, the Northern monkshood. 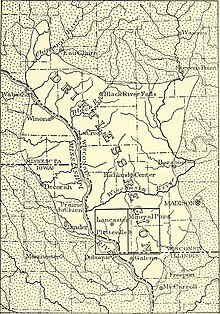 The Driftless Area National Wildlife Refuge was primarily carved out of the Upper Mississippi River National Wildlife and Fish Refuge in order to protect these species and their associated ecosystems. Isolated relic stands of pines and associated northern vegetation are found in some locations where algific talus slopes are present. These trees survive in the cooler Microclimate produced at these locations outside of their current range further north. The Driftless Area is part of the Mississippi Flyway. Many birds fly over the river in large flocks, going north in spring and south in autumn. A modern, man-made characteristic is the comparatively twisty nature of highways in the region, such as in Kentucky, in contrast to the usually rigid east-west/north-south alignment elsewhere in the Midwest[ citation needed]. Here, the roads switchback up stream valleys or travel over ridge tops. The route of U.S. Highway 20 through the Driftless, and particularly in Illinois, is a good example. At the University of Wisconsin-Madison, the Center for Integrated Agricultural System's Food and Farm project is working with the region's sustainable-agriculture farmers, processors, distributors, chefs, planning commissions, and others to define the culinary identity of the region and direct the development of agrotourism. For instance, 75% of the raw-milk artisan cheese produced in Wisconsin is made in the Driftless region. This cheese is made from milk produced by cows that graze on pastures. The region is home to Organic Valley, the nation's largest organic dairy cooperative. Generally, organic dairy production fits best with a grass-based milk production system. In addition to wine-grape production and wine-making, the region also is known for apple production, and a number of hard cider makers are about to hit the market. The region is historically known for grass-fed beef, and has great potential to market forest botanicals - especially mushrooms - to the 21 million people in the region, including the relatively nearby Minneapolis-St. Paul, Chicago, and Milwaukee markets. Due to the presence of Sandstone bedrock at or near the surface, sand mining is a growing industrial activity in portions of the Driftless Area. The sandstone contains quartz (silica) Sand grains of the required hardness, shape, size, and purity that make it ideal for use in hydraulic fracturing utilized by the petroleum and natural gas industries during drilling operations. The mining activity involves quarrying the sandstone bedrock by blasting with Dynamite, crushing the rock, washing, drying, and grading the resulting sand, and transporting the sand out of the region, usually by rail. The recent proliferation of sand mines in the region has created new jobs and economic activity. However, the growth of the industry has also created controversy due to opposition of nearby residents and environmentalists concerned about impacts to water and air quality (silica dust pollution), noise and Light pollution, heavy truck traffic, and the destruction of the hills and ridges for which the region is known. Corresponding to the southeast geological region of Minnesota, the colloquial "Driftless Area" (though the whole region was glaciated) begins at about Fort Snelling. Starting as a narrow sliver against the Mississippi, it widens to the west as one goes south. The western boundary is the Bemis-Altamont moraine. Another more easily located reference to the western boundary is the approximate line of Minnesota State Highway 56. The counties involved include all or part of Dakota, Goodhue, Wabasha, Winona, Olmsted, Dodge, Houston, Fillmore, and Mower. Aside from the southeastern suburban sprawl of the Twin Cities, Rochester is the main urban area. Additional communities include Red Wing, Lake City, Winona, La Crescent, and Caledonia. The largest protected area is Richard J. Dorer Memorial Hardwood State Forest, which contains some state-owned land, but is mostly private, controlled by state conservation easements. Around 85% of the Driftless Area lies within Wisconsin, comprising much of the southwestern quarter of the state. The border is defined by the catchment of the Chippewa River on the north, and somewhat west (or east, depending on if the southwestern portion of Wisconsin's Central Plain is included) of the north-south line of the Wisconsin River. Where the Wisconsin River turns west to join the Mississippi, the area to the south, including the whole of Grant County as well as most of Lafayette County, are part of the Driftless Area. The rugged terrain comprising most of the Driftless Area is distinct from the rest of Wisconsin, and is known locally as the Coulee Region. The steep ridges, numerous rock outcroppings, and deep, narrow valleys in the Driftless Area are in marked contrast with the rest of the state, where glaciers have modified the landscape. 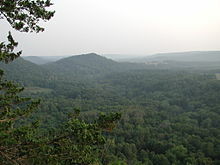 The hilly unglaciated landscape is well represented in Wisconsin's Coulee Experimental State Forest, Wildcat Mountain State Park, Governor Dodge State Park, and the Kickapoo Valley Reserve. Karst topography is most prominent in Wisconsin. Eagle Cave in Blue River, WI and Cave of the Mounds, near Blue Mounds, WI, are better known examples. The Driftless Area is located in all or part of Pierce, Pepin, Eau Claire, Buffalo, Trempealeau, Jackson, La Crosse, Monroe, Juneau, Vernon, Richland, Sauk, Crawford, Iowa, Dane, Green, Grant, and Lafayette counties. If the less restrictive definition of the Driftless Area is used (which includes the unglaciated southwestern portion of Wisconsin's Central Plain), then Adams and portions of southern Wood and Portage counties are also included. La Crosse is the principal urban area wholly within the Driftless Area, while the larger Madison's far western suburbs are located on the edges of the area. Small cities and towns are scattered throughout the region. Numerous Amish settlements are also located within Wisconsin's Driftless Area. The U.S. Army maintains a presence at Fort McCoy, Wisconsin in Monroe County between Sparta and Tomah immediately south of the Black River State Forest. The property is used mainly for military training exercises, although troops have also been based there for deployments overseas. The Coulee Region portion of the Driftless Area comprises much of Wisconsin's Western Upland geographical region. The most rugged part of Wisconsin's Driftless area is also called the Ocooch Mountains. Largely rural in character, land cover is forest, farmland, and grassland/pasture; modest wetlands are found in river valleys, and along the Mississippi. Row crop farming is less encountered than elsewhere in the state. Away from the Mississippi, Wisconsin, and other major rivers, much of the terrain is gently rolling, supporting dairy farms. In other areas, the rugged nature of the topography in the region is not conducive to farming, except on ridge tops and in river valleys. The sides of the ridges are often too steep for farming, and are usually forested. The Coulee Experimental State Forest near La Crosse was created in part to test soil conservation practices to prevent soil erosion in the hilly Driftless Area. The northeastern portion of the Driftless area was covered by or bordered by Glacial Lake Wisconsin during the Wisconsin glaciation. The steep-sided rocky bluffs present in Roche-a-Cri State Park and Mill Bluff State Park are Cambrian outliers of the Franconia Cuesta to the southwest and were once islands or sea Stacks in the ancient lake. The flat plain in which these bluffs lie is located in the southwest portion of Wisconsin's Central Plain geographic region, and was created in part by sediments falling to the bottom of Glacial Lake Wisconsin. This flat plain consists of sandy deposits and contains many Bogs that were left over from Glacial Lake Wisconsin. Many of these bogs have been converted into cranberry marshes, helping to make Wisconsin a leader in cranberry production. The remainder of the sand plain consists of forest and irrigated farmland. The Dells of the Wisconsin River were carved through the bedrock during the sudden draining of Glacial Lake Wisconsin at the end of the last Ice age. Due to the lack of natural lakes in the Coulee region, several large artificial lakes have been created for flood control and recreational purposes, including Dutch Hollow Lake and Lake Redstone in Sauk County, Blackhawk Lake in Iowa County, and Yellowstone Lake (in Yellowstone State Park) in Lafayette County. Plans for a large Reservoir on the Kickapoo River at La Farge, Wisconsin were dropped in 1975 after much controversy due to cost-benefit and environmental concerns. Land previously acquired for the reservoir became the Kickapoo Valley Reserve. Wazee Lake, at 355 feet (108 m) deep, is Wisconsin's deepest inland lake, and is located in Jackson County in the northeast portion of the Driftless area. The artificial lake lies in the former open pit Jackson County Iron Mine and is the centerpiece of the Wazee Lake Recreation Area. Due to its great depth, vertical underwater cliffs, clear water, and submerged mining features, the lake is popular with scuba divers. The highest point in the Driftless area is West Blue Mound, with an elevation of 1,719 feet (524 m). The feature is located in Blue Mound State Park, in Iowa County. During and 19th and early 20th centuries, Lead and Zinc mining was a major industrial activity in the Driftless Area, drawing many foreign immigrants to settle in the region to work in the mines. Early miners often lived in the mine tunnels, leading outsiders to compare them to the burrowing Badger; a nickname that eventually came to be used for all Wisconsin residents. An example of an early lead Shot tower and smelting house is preserved in Tower Hill State Park. Due to the influx of early miners, the lead mining region became Wisconsin's most populous area at the time. The first capitol of the Wisconsin Territory was located for a short time at Belmont, Lafayette County in the heart of the lead mining region. The site of the first capitol is preserved in First Capitol Historic Site. Three units of the Ice Age National Scientific Reserve are located within or adjacent to the Driftless Area: Devil's Lake State Park, Mill Bluff State Park, and Cross Plains State Park. In addition, the Ice Age Trail follows the Terminal moraine of the maximum glacial extent from the last ice age and enters the Driftless Area in several locations. Other notable natural features include the Baraboo Range (consisting of two heavily forested, steep, rocky Quartzite ridges with mountain-type scenery), rock formations in Natural Bridge State Park (Wisconsin), the forested bluffs, floodplains, islands, and sandbars in the Lower Wisconsin River State Riverway, the confluence of the Wisconsin River with the Mississippi River at Wyalusing State Park, Trempealeau Mountain State Natural Area in the Mississippi River valley at Perrot State Park, and the gorge and rock formations surrounding the Wisconsin River at the Dells of the Wisconsin River. The Black River State Forest protects a large area of North Woods, rocky bluffs, sandy plains, and river shoreline on the northeastern edge of the driftless area that provides habitat for several Wolf packs and one of Wisconsin's reintroduced elk herds. Aerial view looking north, April 14, 2001, with the Upper Mississippi River at floodstage. At center, the Black Hawk Bridge is visible. Big Lake is immediately north. Just south of the bridge one can see the mouth of Clear Creek, and just south of this, the mouth of Village Creek. The rugged nature of the Driftless Area is evident. The contrast between what the rest of Iowa looks like and what the Driftless Area presents is remarkable. For counties inland from the Mississippi, the evidence is largely confined to the valleys of streams and rivers. It encompasses all of Allamakee, and part of Clayton, Fayette, Delaware, Winneshiek, Howard, Dubuque, and Jackson counties. Dubuque is the only metropolitan area. The region is distinct from the "Iowan Erosion Surface to the west and the Southern Iowa Drift Plain to the south." A line east of the most easterly tributaries of the Wapsipinicon River defines the terminal moraine that marks the western boundary of the Driftless, with the catchment of the Maquoketa River serving as a southern boundary. The most western tributaries of the Upper Iowa, Yellow and Turkey Rivers flow east and south from the vicinity of this moraine. The most impressive area is on the Mississippi, between Pikes Peak State Park, opposite the Wisconsin River down to Guttenberg, where bluffs lining the river reach their maximum height. This is apparently an Iowa continuation of Military Ridge, a catchment-defining divide in Wisconsin that was used for the Military Ridge Road, a portion of which is included in Military Ridge State Trail, both across the River in Wisconsin. Effigy Mounds National Monument is at the heart of a network of adjacent parks, state forests, preserves, as well as national wildlife refuges, all of which preserve and illustrate the features of the Driftless, where "patchy remnants of Pre-Illinoian glacial drift more than 500,000 years old recently have been discovered in the area." Additional protected areas are Cold Water Spring State Preserve near Decorah, Maquoketa Caves State Park northwest of Maquoketa, White Pine Hollow State Forest (which protects Iowa's only remaining groves of old-growth white pine trees) near Dubuque, and the Yellow River State Forest in the southeastern corner of Allamakee County, Iowa. Charles Mound, the highest natural point in Illinois at 1,235 feet (376 m) NAVD 88,  is located in the Illinois portion of the Driftless Area. This portion lacks any true urban center. East Dubuque is really a part of metropolitan Dubuque, while Galena retains the character of a small Midwestern county seat. The valley of the Apple River has a major canyon, with Apple River Canyon occupying much of it. The mouth of this river, near Hanover adjacent to the former Savanna Army Depot, comes close to the southern end of the Driftless Area on the eastern side of the Mississippi (see Lock and Dam No. 13). As in Wisconsin, the Illinois portion of the driftless area was a major early center for Lead and Zinc mining. The city of Galena, Illinois was named after the lead sulfide mineral Galena. ^ U.S. Department of Agriculture Natural Resources Conservation Service. Driftless Area Landscape Conservation Initiative. Retrieved August 25, 2017. ^ Iannicelli, Michael (2010). "Evolution of the Driftless Area and Contiguous Regions of Midwestern USA Through Pleistocene Periglacial Processes". The Open Geology Journal. 4 (1): 35–54. doi: 10.2174/1874262901004010035. ^ "Native American use of the Mississippi River". Archaeology Education Program, vol. 22, no. 2 (Fall 2004):1. Retrieved January 25, 2018. ^ "Y01 - Waukon Municipal Airport". AirNav.com. AirNav, LLC. Retrieved May 1, 2014. ^ "Station Information for Mississippi River at Lock and Dam 9 (Lynxville, WI)". Rivergages.com. Army Corps of Engineers. Retrieved May 1, 2014. ^ "Walker Declares Statewide Emergency After Storms Ravage Communities". Wisconsin Public Radio. 2018-08-29. Retrieved 2019-02-06. ^ Tribune, Mike Tighe La Crosse. "La Farge grapples not only with flooding but also no power". La Crosse Tribune. Retrieved 2019-02-06. ^ Broadcaster, Angela Cina Vernon County. "Vernon County's Jersey Valley, Mlsna dams fail due to heavy rains". La Crosse Tribune. Retrieved 2019-02-06. ^ "Driftless Area Restoration Effort". Trout Unlimited. Retrieved May 1, 2014. ^ Epstein, E.E. (2017). "Natural communities, aquatic features, and selected habitats of Wisconsin". The ecological land- scapes of Wisconsin: An assessment of ecological resources and a guide to planning sustainable management (PDF). Wisconsin Department of Natural Resources. Retrieved 1 October 2018. ^ Dahlke 2018-10-01T12:55:00-04:00, Josh. "Fishing the Driftless Area: The Best Kept Secret in the Trout World". Outdoor Life. Retrieved 2019-04-09. ^ "Upper Mississippi River Valley American Viticulture Area". Upper Mississippi River Valley Association. Retrieved May 1, 2014. ^ Miller, Michelle (June 6, 2011). "American Viticultural Area Petition For Upper Mississippi River Valley". Upper Mississippi River Valley Appellation Committee. Retrieved May 1, 2014. ^ ""Glacial Geology of the "Driftless Region"". Archived from the original on March 28, 2008. Retrieved July 9, 2007. ^ "ECS: Paleozoic Plateau Section: Minnesota DNR". Dnr.state.mn.us. Retrieved 2015-03-01. ^ "Map of moraines in Twin Cities area". Winona.edu. Retrieved 2015-03-01. ^ Statistical Information on Wisconsin (PDF). State of Wisconsin Blue Book 2005 − 2006. Wisconsin Legislative Reference Bureau. July 2005. pp. 691–694. Archived from the original (PDF) on March 24, 2009. Retrieved May 1, 2014. ^ Find Maps | Find Maps Archived 2009-01-05 at the Wayback Machine. Sco.wisc.edu. Retrieved on July 21, 2013. ^ "Landforms of Iowa" (PDF). Uni.edu. Retrieved 2015-03-01. ^ "Charles". NGS data sheet. U.S. National Geodetic Survey. Retrieved 2008-12-17. ^ "Illinois Natural History Survey, 1996". Inhs.uiuc.edu. Retrieved July 7, 2007. 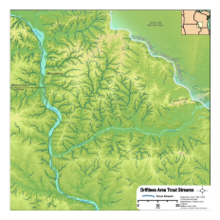 ^ "Driftless Area Critical Trends Assessment: The Area at a Glance". Illinois Department of Natural Resources. Archived from the original on July 14, 2014. Retrieved July 9, 2014. Wikivoyage has a travel guide for Driftless Area. A Sand County Almanac: A book written by Aldo Leopold about the flora and fauna in the Coulee region.